Mary Quant made getting dressed fun. The British fashion designer shook up the industry in the 1960s with her savvily marketed, mass-produced clothes that women could actually move in. A rebellious art-school graduate who once dyed her pubic hair green and trimmed it into the shape of a heart, Quant refused to follow her school-teacher parents’ advice that she become an art teacher. Instead, in 1955 she and her aristocratic husband, Alexander Plunket Greene, opened a shop called Bazaar, selling a “bouillabaisse” of products (as Quant put it), on the hip and happening King’s Road in Chelsea. It became very popular very fast, and soon morphed into Quant’s eponymous brand, which sold clothes and make-up. 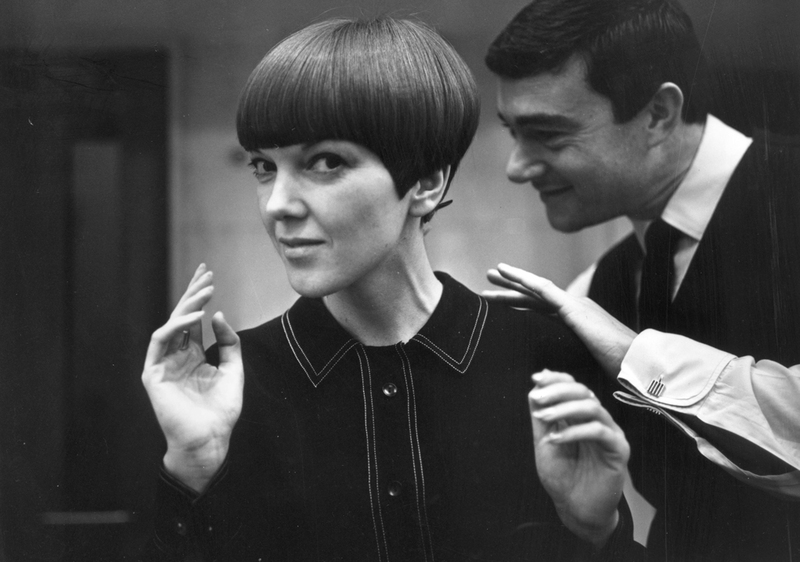 Mary Quant made a “Chelsea Girl” – lithe, leggy and a little bit unconventional – the thing to be. She popularised the miniskirt, made trousers an indispensable part of every woman’s wardrobe, and brought the American “house-wear” trend – hot pants, jersey tops, and terry-towelling all-in-ones – to Europe. Celebrities loved her. The models Jean Shrimpton, Twiggy and Grace Coddington all wore her designs, and Quant made coats for George Harrison and Pattie Boyd when they got married in 1966: a black Mongolian-lamb-fur coat for Harrison and a red fox-fur coat for Boyd. More than 100 of Quant’s designs are now on display at the Victoria & Albert Museum in London in a delightful exhibition that traces the evolution of her visionary, daisy-logoed brand. 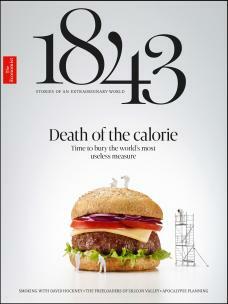 It focuses on the years between 1955 and 1975 when Quant’s popularitiy was at its peak in Britain and America. Last summer the V&A asked the public if they could help by donating or loaning their own Quant pieces, make-up, photographs and other ephemera. More than 1,000 people responded, including Linda Griffiths, whose “prized possession”, a pinstriped raincoat, made the final cut. An aspiring mod from Wales, she found it while trawling flea-markets in London. This crowd-sourced element and the charming stories that go with it are part of what makes the show so great. Exuberant, innovative and often very cheeky, her designs were the product of a moment when society’s views of gender were changing. If women could have more control over what was happening inside them, with the introduction of the Pill, it followed that they should have more choice over what they looked like on the outside. Quant capitalised on this mood with clothes that were bursting with colour and sass. Short skirts freed up women’s legs so they could run for the bus at full pelt, PVC rain-coats made even the wettest day less grim, and tights the colour of garish costume-jewellery turned legs into statement pieces. The twinsets, circle-skirts and pearls that mothers preferred were cast aside for simple, bright, thigh-skimming designs that borrowed from the boys with their waistcoats, zips and tailoring. When I went to the exhibition, mothers and daughters gazed adoringly at perfectly tailored jumpsuits and Peter-Pan-neckline, jersey-knit dresses. Old friends reminisced about outfits from half a century ago, and old men who’d been dragged there by their wives looked slightly bewildered but seemed to be enjoying themselves. I kept hearing people say to each other that they’d happily wear most of the exhibits today. I wanted all of it, apart from maybe the coloured tights. When Quant got this haircut in 1964 the tabloids leapt on it. “Quant gets that boyish look” screamed the Daily Mail. Vidal Sassoon was the man with the scissors, and this unusual “five point” style quickly became the cut to have. Quant knew how to pose. Instagram influencers should take note of the curl of her hand; that coy glance across to the right. She looks elfin and feminine, but not in the boring, prim way that Audrey Hepburn did with her pearls, turtlenecks, short fringe and long cigarette holder. Not a single hair is out of place here, but she doesn’t look uptight. She’s that cool girl at school you wish you were friends with. Sassoon has faded to the background here, he’s well and truly the supporting actor. But he’s not bothered. Look at those smiling eyes. He knows he’s done well with this startling chop. Quant was good at making the most of the spotlight. She knew everyone was keen to see what she’d get up to next. Quant played hard – a Donovan song from 1966 called “Sunny South Kensington” included the lyric “Jean-Paul Belmondo and Mary Quant got stoned, to say the least” – but not as hard as she worked. The early days were especially tough and required serious grind. Quant described the experience of running Bazaar as “an awful hand-to-mouth existence”. She was ignored by the fashion elite who were still fixated on Parisian couture, and spent her nights sewing garments in her bedsit and fretting over the shop’s disorganised accounts with her husband. But before long, office girls and upper-class society darlings were pawing her dresses, having been lured into Bazaar by Quant’s witty, technicolour window displays (one featured a dead lobster on a lead; another a Harley Davidson motorbike). This picture shows Quant, in a burgundy Peter-Pan-collar dress, surrounded by a gaggle of models at the launch of the “Quant Afoot” footwear. By 1967, she was something of a mogul – the business had gone transatlantic, started a diffusion line called the Ginger Group and launched a cosmetics range, while Quant herself had been awarded an OBE and published her autobiography. 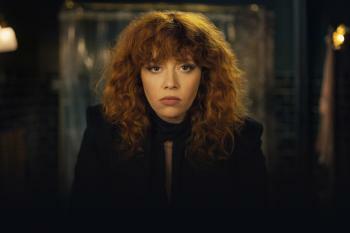 Here, however, she looks as young and playful as ever. Her clothes embody her youthful spirit. Note the grey pinafore dress worn by the redhead in the yellow tights and that sailor-style collar on the burgundy dress worn by the strawberry blonde. None of these outfits would look out of place on a child. “I didn’t want to grow up, perhaps that’s something to do with it,” she said. This playfulness meant that modelling for Quant was “a gas”, in the words of one woman who was interviewed in a film that’s projected on a wall in the exhibition. Walking down her catwalks was “like going to your friend’s party.” The models did their own make-up and danced down the catwalk while a pop group performed. This was radical stuff in the early 1960s. Then, the norm was for models with emotionless faces, hairsprayed locks sculpted into beehives, and bodies squished into uncomfortable corsets to walk stiffly down the catwalk while a male presenter droned through boring descriptions of each garment one by one. Music was a no-no. By contrast, Quant’s shows were so wild that sometimes they’d end with a visit from the police or even the fire brigade. 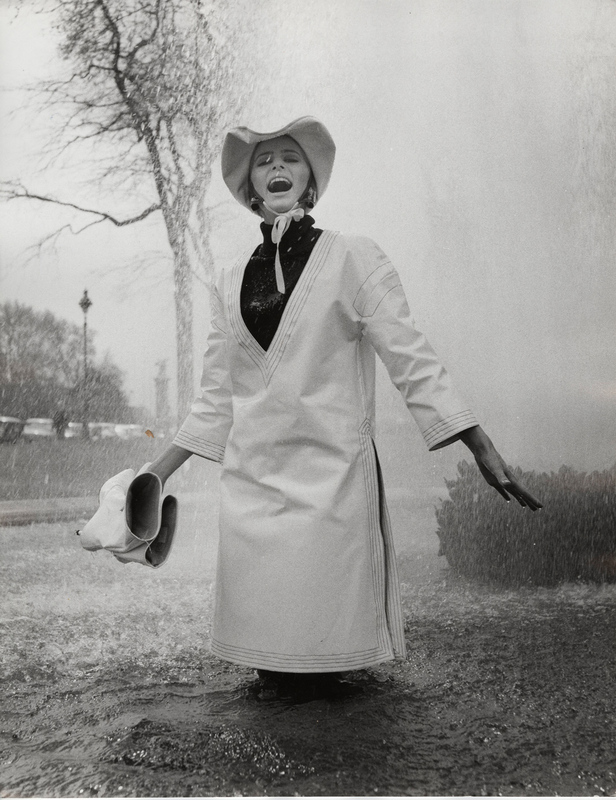 One of Quant’s most popular innovations was her PVC raincoat, modelled here by Jill Kennington, who looks as though she’s squealing with joy, despite being up to her thighs in a puddle. The “Wet Collection” was launched at a fancy hotel in Paris in 1963. Retailers placed orders en-masse, hoping their customers would be as entranced by the fabric as Quant, who described herself as being “bewitched...with this super shiny man-made stuff and its shrieking colours”. The finer details of the raincoat took some ironing out. Problems with the process that sealed the seams in the fabric meant that Quant’s PVC rainwear didn’t actually hit the high street for another two years. She was forced to collaborate with Alligator Rainwear, a British manufacturer with experience in mass-producing the tricky fabric.